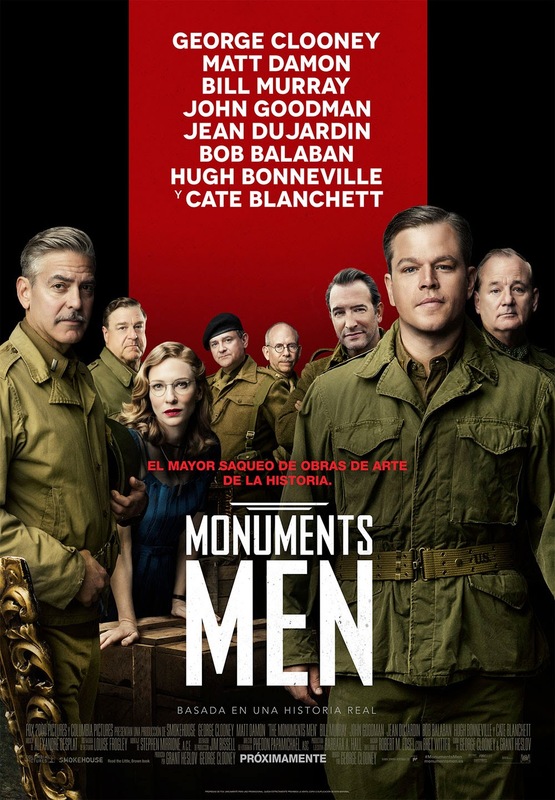 George Clooney stars and directs, based on Robert Edsel's 2009 book, The Monuments Men: Allied Heroes, Nazi Thieves and the Greatest Treasure Hunt in History. It's late in the game during WWII. An international squad of art experts and historians is patched together with some army glue and sent to find and retrieve stolen masterpieces from Nazi claws in the midst of the waning European conflict. Led by Frank Stokes (Clooney), they're playing catch-up with constant German maneuvering while trying to side-step the scaled-down skirmishes that dotted the countrysides while Hitler's brood was on the run. There are four other Americans - Granger (Matt Damon), Campbell (Bill Murray), Garfield (John Goodman) and Savitz (Bob Balaban) - plus an Englishman named Jeffries (Hugh Bonneville), the Frenchman Clermont (Jean Dujardin), and Epstein (Dimitri Leonidas), a German-Jew now living stateside. 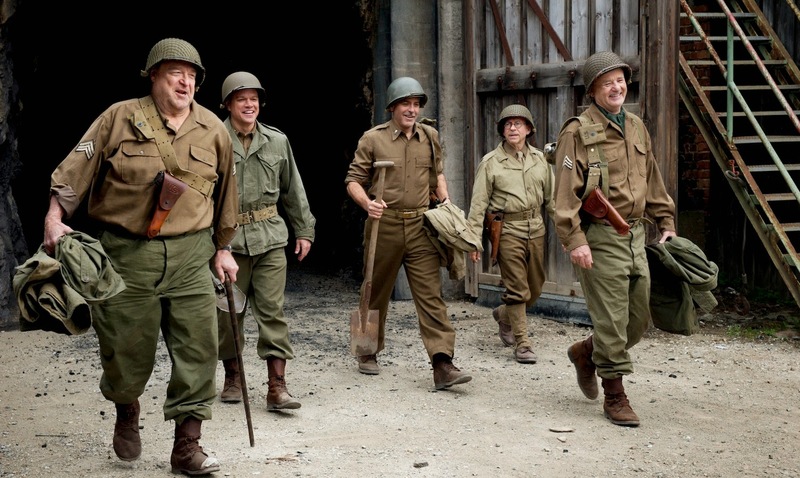 These Monuments Men are a peripheral expense. An exercise in cultural appeasement when the world is growing tired of bloodshed. There are no welcome salutes or party barracks. Tents are pitched for whiskey IV's and manly man killers, not soft fanatics. D-Day and Patton were already legend by the time this team dusted its boots, and never pretending to be on a mission to save dying breaths, the Men are hell-bent on preserving mankind. They're caretakers of artistic achievement without regard for borders or branding. Uniforms are just necessary garb to tell the shooters from shiners. 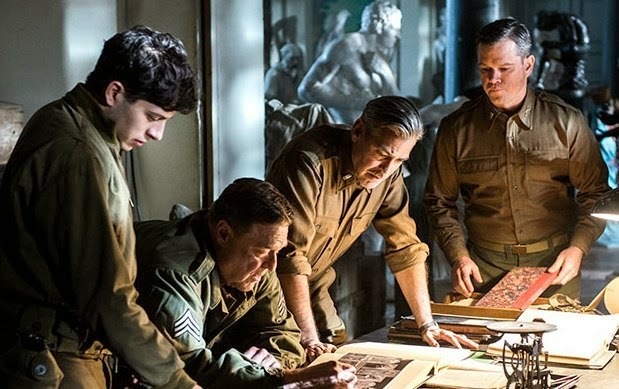 Clooney makes it clear that this is not a war movie in the way we've known war movies to be. This is not a combat film. This is no rock-em sock-em, body part flying battlefield flick. This is espionage borne of pride. Danger bloomed on international morale. It wants to ask who gives a piss about sovereign borders and power plays for influence. The Men are saving centuries of innovation and inspiration. By intended design, the film feels like the '40s in the way the '40s feel when watching films from the era. The sets are well-apportioned and matted to a perfect balance of light and dark. There's a smoky train station and close-quarter gunfights without the cavernous triviality of CGI. There's wonderment emblazoned in the Men's eyes by the simplicity of their success. The film teems with warmth, responsibility and duty. Clooney's choice cast brims with genuineness. You actually believe it could have lived through this, partaken in this. Played pillar straight, Murray and Damon are all conscientiousness, while Balaban is the backbone despite his insecurity and small stature. Goodman and Dujardin are the heart - like unlikely schoolmates turned buddies when shared circumstances leave them no choice. 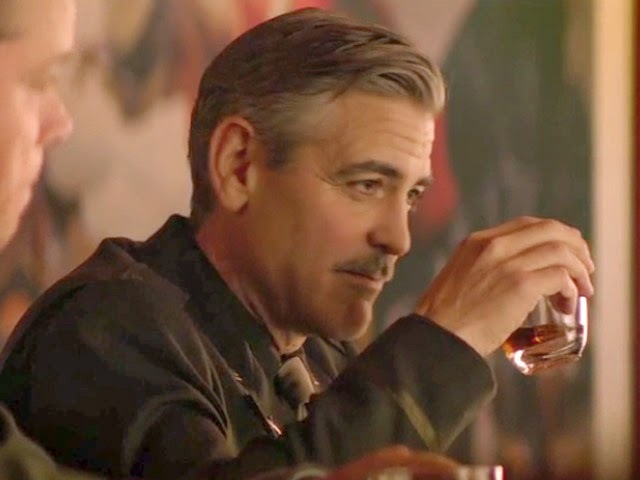 Clooney matches Bonneville's enthusiasm, unafraid of martyrdom, balanced by desperate hope for home and better days. Their leadership is pointed and direct, with no wrenching jingoism flooding the pond. 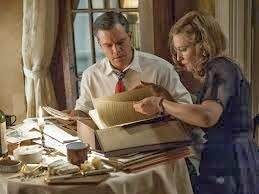 Every actor is terrific and every performance is graced with sincerity and real affection that the cast seems hand-picked from long ago, stored away only to be unwrapped as a gift to modern audiences. Underlying the simple premise - and to think it's a mostly true story - are meaty themes often missing from so-called war movies. The pseudo-Mexican standoff among Campbell, Savitz and a derelict German soldier is cleverly diffused by the mutual understanding of the inanity of war. There’s a buy-in that in most other films would feel forced, fake and unabashedly saccharine. But here, it’s refreshingly honest and Clooney delivers character moments etched in the overall story and theme of integrity. Watch how the camera closes on Granger's wedding band when he thinks better of cheating in an open invite to bed Simone (Cate Blanchett), the French spy helping the cause. Note the tense two-shots and boxy barbarism of a kid sniper whistling bullets past the heads of Garfield and Clermont, the absurdly dangerous and ultimately deadly shoot-out in the pasture, and Jeffries' somber demise under the presumed safety of a church's roof. Nothing too sensational. Nothing ever obvious. Death at its most noble and numbing. The flick is not without missteps. The most blatant being the depictions of FDR and Truman - ultra-famous figures never play well in small samples - and the awful, Spielberg-ian final scene. You'll see. But these are minor gripes. This is the sort of movie that zips in and out of theaters, and often the public conscious, given its time of release and understated quality. I hope it finds a bigger and more appreciative audience at home.